Beautiful does not have to mean expensive. 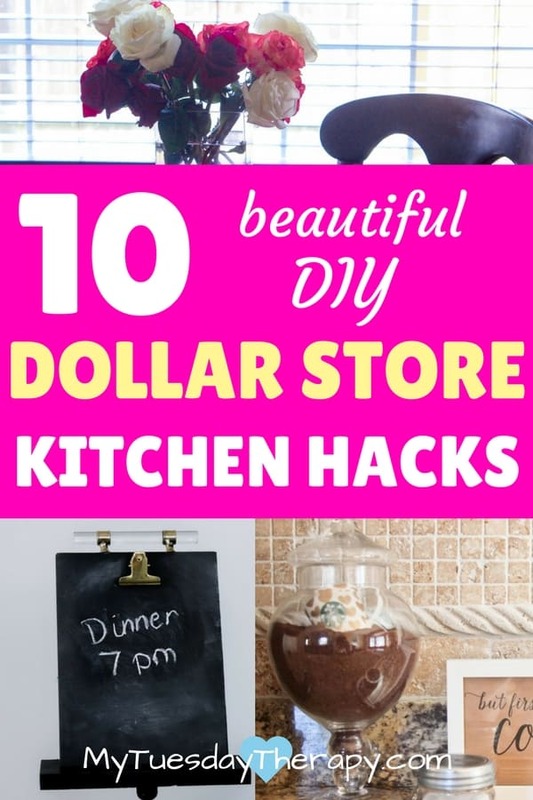 These DIY Dollar Store Kitchen Hacks will transform your kitchen into a beautiful place that you will delight to work in and chat with friends over a cup of coffee. Image and Tutorial Credit: Our Cozy Cottage. 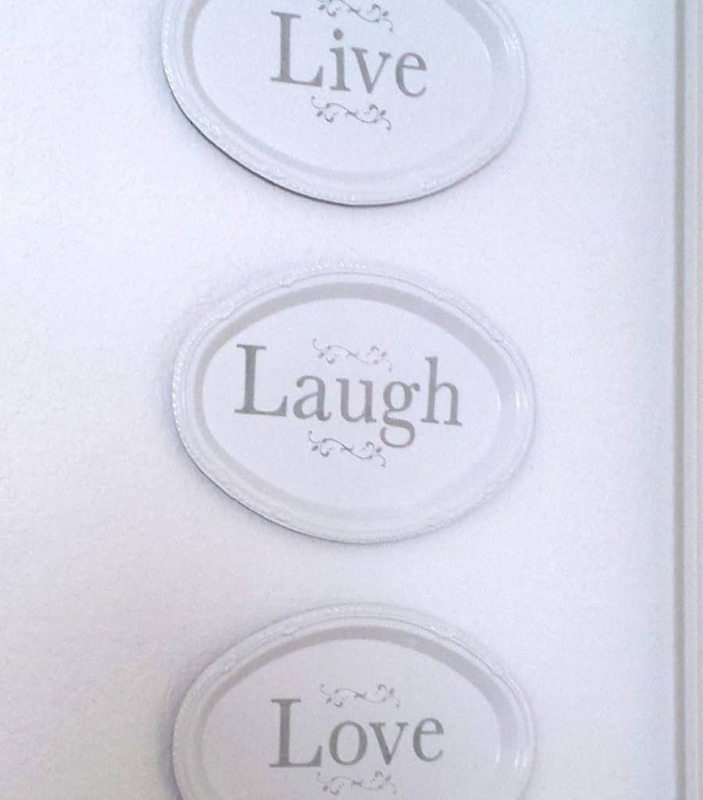 Live, Laugh, Love. That’s what we want! 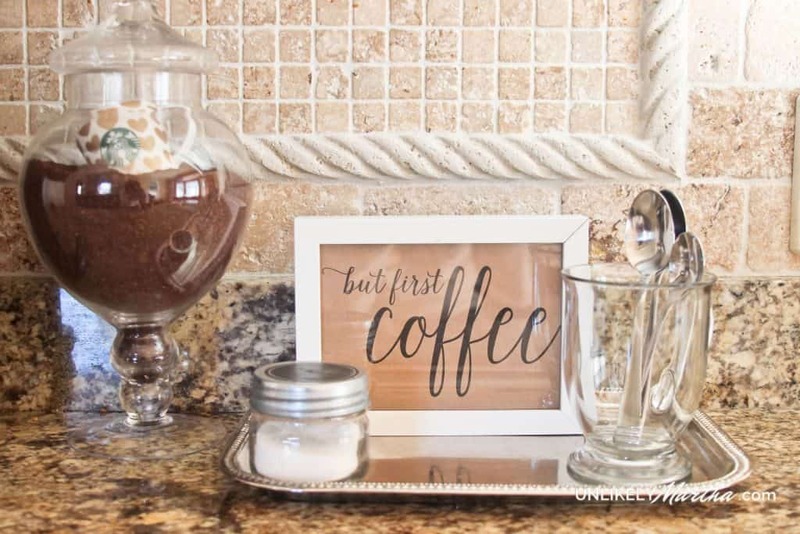 You can make this beautiful wall art very easily with Dollar Store trays and by following the tutorial from Our Cozy Cottage. I like the simple design and using stickers. Also, if you are are artistic painting some delicate flowers or other designs won’t be a problem. I could see having these for various seasons or for specific holidays. 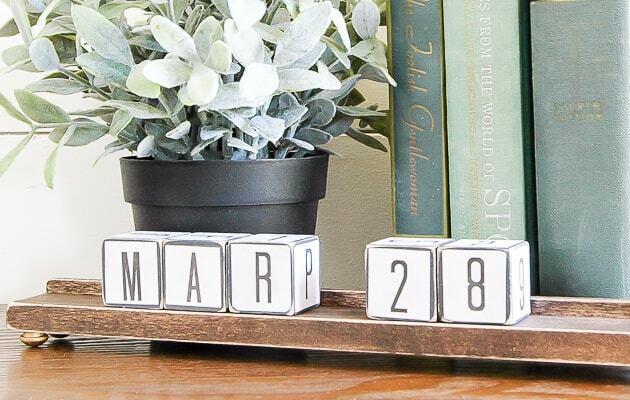 Who would have thought that cheap, bright colored children’s wood blocks could be turned into a farmhouse style wood block calendar! This calendar would be so cute on a kitchen self or anywhere in your house. Take a look at the tutorial at Our Little House of Four. You’ll find there other awesome ideas too. This accordion rack would be so perfect to hang the pretty aprons or kitchen towels that often get stuffed in drawers or pantry shelves! The awesome tutorial can be found at Drawn to DIY. This rack would look really nice also stained or painted. And these lovely polka dot aprons can be bought here. Isn’t this just darling. I love the cute neckline and the handy pockets. And after working in your pretty apron it is time for a coffee break. I’m not a coffee drinker but this looks so lovely that it makes me want to have a cup of coffee! Unlikely Martha will also show how to organize a drawer to store all your coffee essentials. This idea could very well be used for making a Tea Time Station. I love tea and herbal teas would look pretty in a glass jar. Who says you can’t have a hot cocoa bar year-around. If one can drink coffee then it is okay to have a cup of hot cocoa as well! This cute idea is from Re-Fabbed. Have a cup of hot cocoa and play these cool Winter-Themed Board Games. You will have a blast! 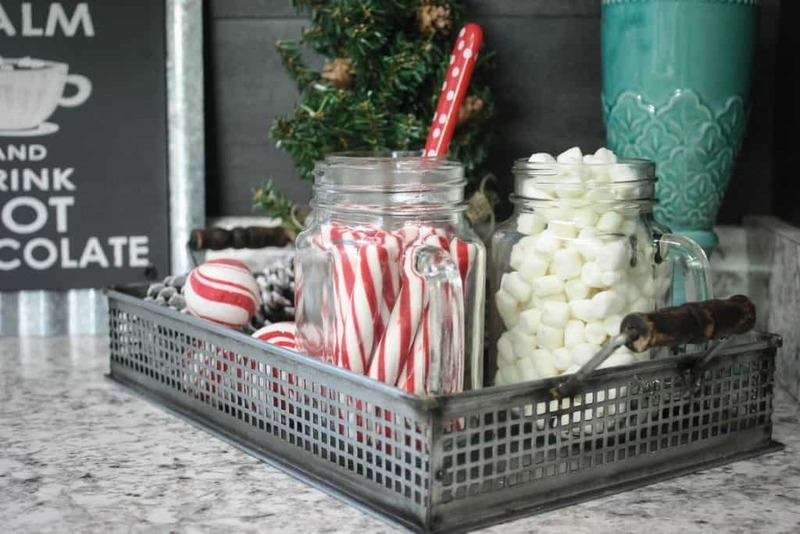 And how about a hot cocoa bar for you next Fun-Filled Ice Cream Social! 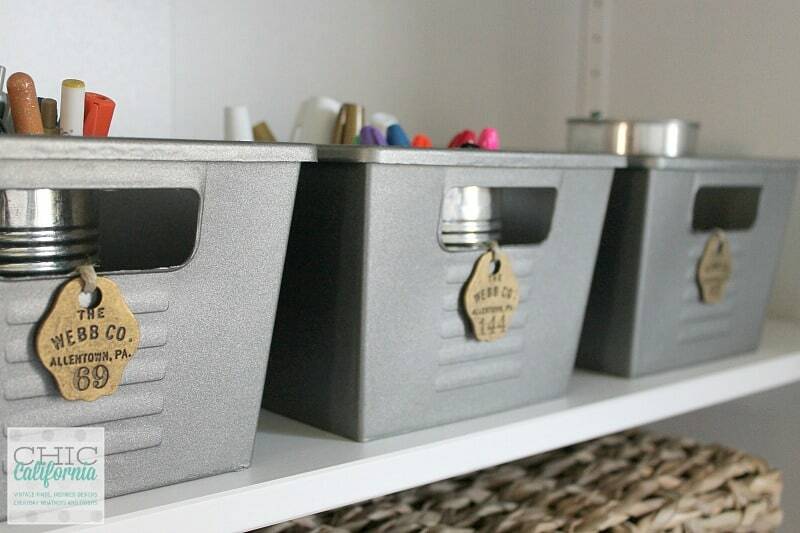 Would you believe that these are cheap green plastic bins from a dollar store! It is amazing what you can do with spray paint. Those tags are pretty awesome too. No need to hide these behind closed doors. Though here they are used for craft items I can see these working so well in a kitchen too. Make them to match your style! 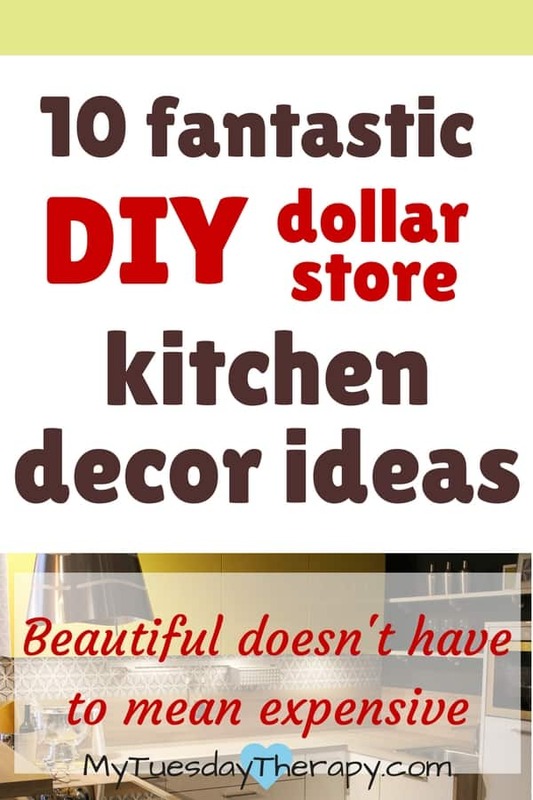 You’ll find more beautiful pictures and a tutorial at A E Home Style. 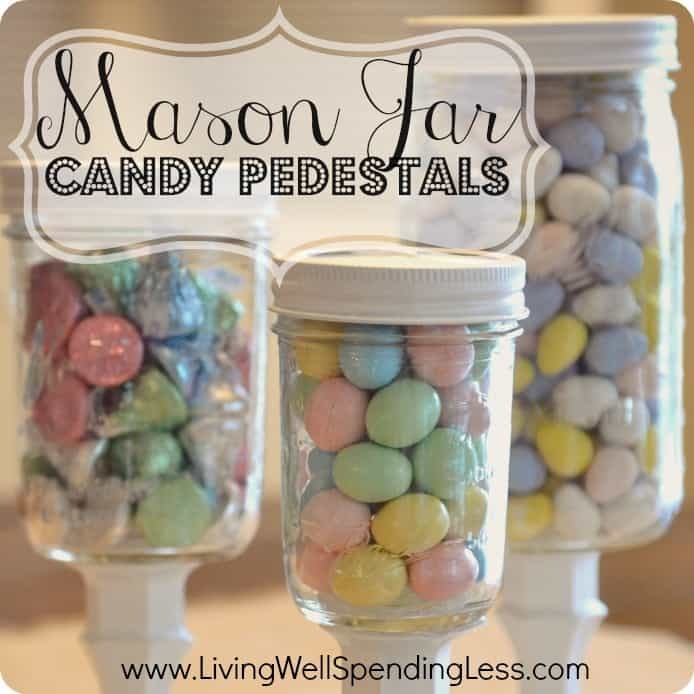 These Mason Jar Candy Pedestals from Living Well Spending Less are adorable! And they are easy to make! If you don’t have mason jars around you could use any glass jars with tops. Though they are called candy pedestals these could be used for so many things like tea, spices, and nuts. They do look really good with the colorful candy. I’m just not sure how long that candy would last in our house. I’d have to refill them quite often. I don’t know about your pantry but mine seems to get disorganized quickly… especially after a trip to Costco and trying to figure out where to put all the giant size items. 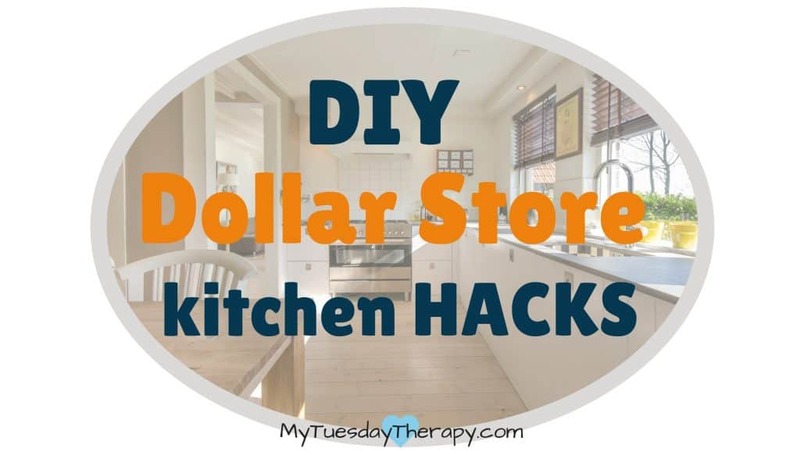 One way to prevent the chaos in the pantry is by using nice containers from dollar store and beautiful labels like these from Social Home Blog. 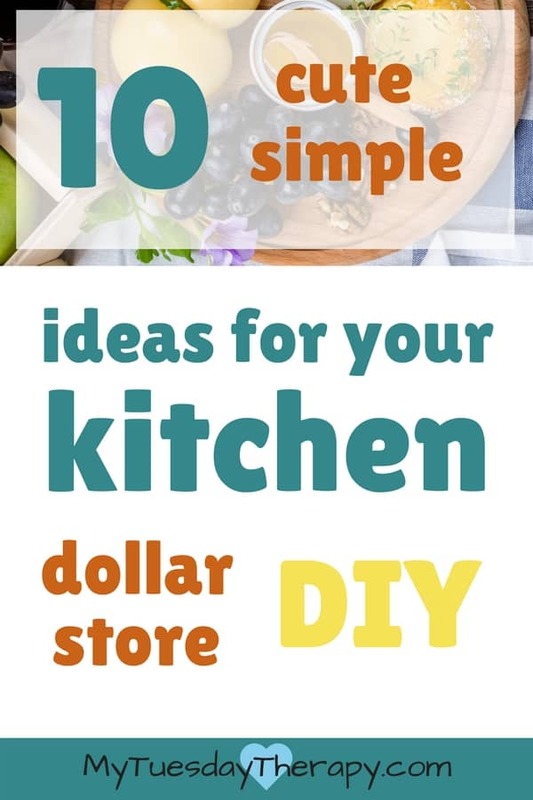 When the pantry is organized you won’t feel bad opening it in front of guests and maybe it will make working in the kitchen more pleasant too. 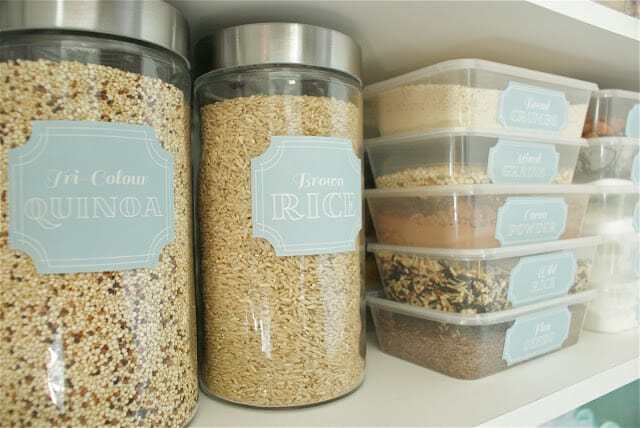 And besides these lovely containers would work perfectly on open shelves too. 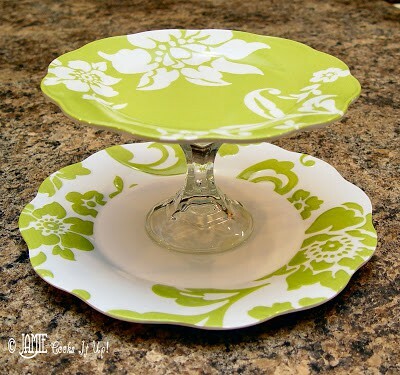 You can make this beautiful tiered serving platter with items from a dollar store! Next time you see the candlesticks and plates, grab a couple and make this by following the tutorial from Jamie Cooks It Up. Imagine the various styles you can make. It does not have to be only a two tier platter. These would be so cute for serving cookies or fruit at your next party or coffee time with a friend. Maybe it could even be used for mail and holding keys etc. This is so cool! 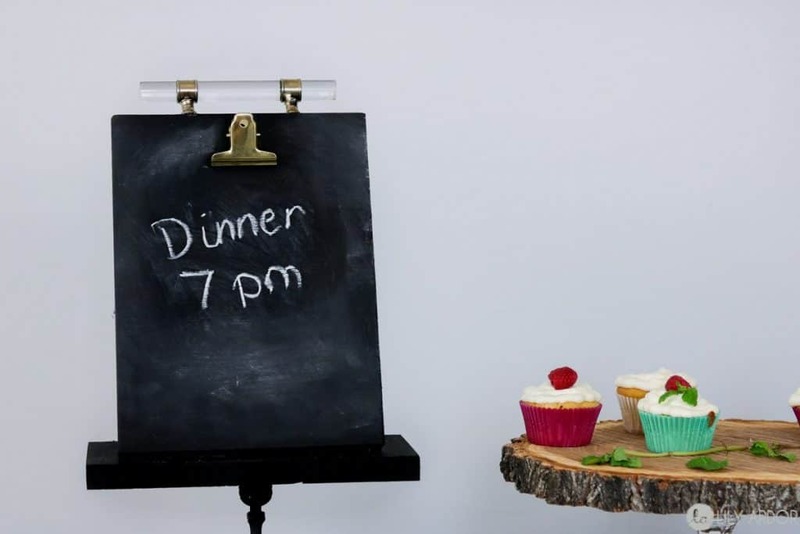 You too can make this recipe/chalkboard stand from Lily Ador. I like that it has the clip on it so you have the option of using the clip to attach a menu or a to-do list. Though she bought her clip separately I don’t see why this could not be done with a dollar store clipboard. Dollar store is a great place to make awesome finds. Take your time strolling around and using your imagination. Who knows what you can come up with!